A lite take on Khao Soi with carb-free Zucchini Noodles and homemade Yellow Curry Paste. 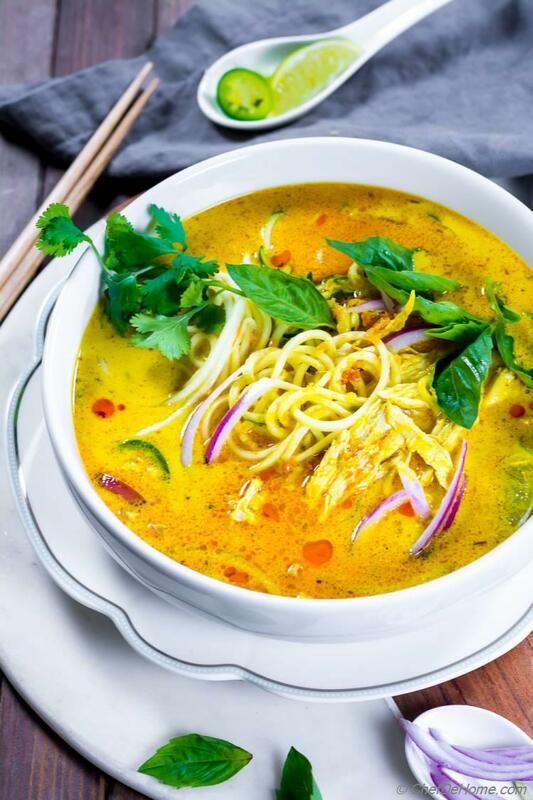 Pleasantly sweet, creamy and spicy, this yellow coconut curry soup is loaded with protein, dairy-free, and gluten free with fresh zucchini noodles. 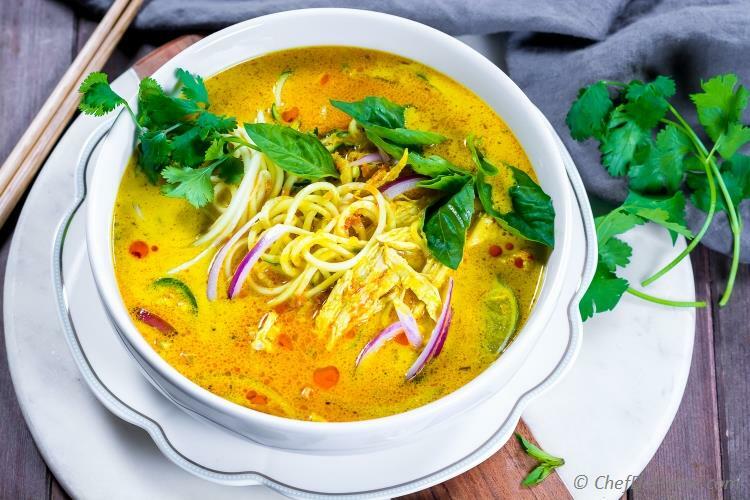 Chicken Khao Soi - A deliciously sweet and spicy Yellow Coconut Curry Soup made with homemade Thai yellow curry paste. 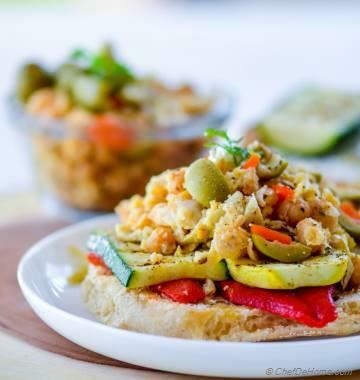 Loaded with white meat chicken and rice (zucchini) noodles.. 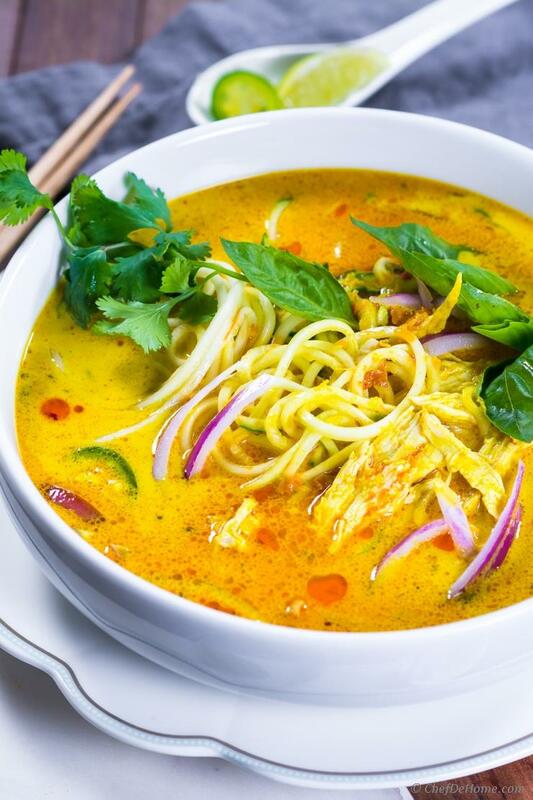 This flavorful soup is my low-carb take on traditional Khao Soi - a Northern Thai Yellow Curry Soup. Gluten free, dairy free, soy free, and super easy to put together. Today's recipe is special for two more reasons: 1) It is first recipe of CDH in year 2018. 2) I'm happy to maintain my resolution and share no-carb and high-protein version of traditional Khao Soi. Honestly, Thai yellow curry has not got as much attention world-wide as Red Curry and Green Curry. But in one line I can tell you, if you like coconut curry and like Madras curry powder? This delightful soup will make you very happy. For me highlights of this soup are: silky aromatic yellow coconut curry broth and zucchini noodles. Khao Soi or Khao Soy is very popular street soup in North Thailand. The Khao Soi name means "cut rice" in Thai. Different version of this soup uses different preparation of noodles. Some serve this soup with fried noodles, some with egg noodles or some with wide rice noodles. My take on Khao Soi is very similar to traditional but still slightly different... In simple words, I kept this soup low in oil, carbs, and shell-fish free. 1) Carb free Zucchini Noodles: Like I mentioned, traditional Khao Soi soup has toppings of fried (and/or regular boiled) egg noodles. Almost like crunchy element of tortilla in Chicken Tortilla Soup. When I decided to make this soup for South Beach Diet Plan... I decided to skip rice/wheat noodles completely. 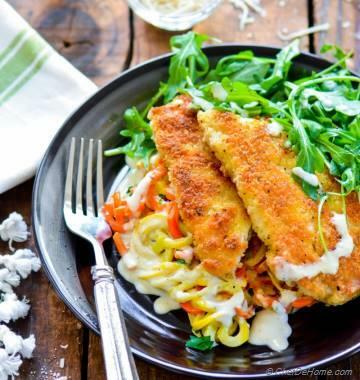 Instead, added spirialized zucchini noodles to give it slurp-worthy texture without carb-guilt. 2) Simple Fresh Toppings: Traditional soup has various other toppings: bean sprouts, sliced red onion, fried pork, fermented mustard greens, cilantro, lime wedges etc. I kept it simple with fresh Thai basil, red onion, leaves of cilantro, and lime wedges. Splash of lime is makes this soup delightful. 3) Soy/Shellfish Free Soup: Traditional Soup is flavored with shrimp paste. Shrimp paste is mostly added to yellow curry paste (khao soi paste). I kept my yellow curry paste shrimp/soy free. If not in paste, shrimp sauce can be added to curry broth. 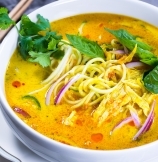 So, if not shrimp, how do I keep Khao Soi Soup flavorful? I cook fresh chicken with the broth until it is fork tender. That's it! Just like my Made-from-scratch Chicken Noodle Soup..Fresh chicken gives plenty of meaty chicken flavor to the soup. Makes it so aromatic and robust that fish flavor is not needed. Please note that shrimp sauce also work as seasoning which means salt needs to be adjusted (to taste) to bring-out the flavor of coconut and curry. 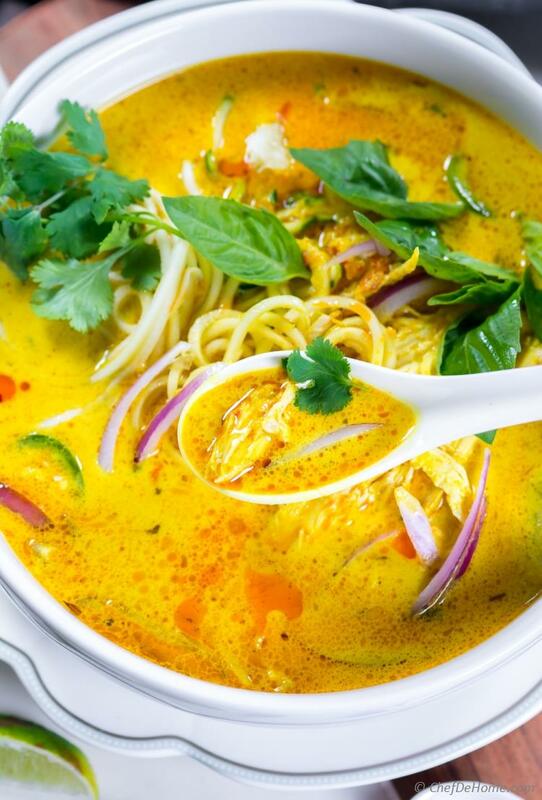 Chicken Khao Soi is really Asian Chicken Noodle Soup with yellow coconut curry base broth. It is as good to sip for a cold January night (with snow and flue season) as it is to include in South Beach Diet Plan. It's low-carb veggie zucchini noodles, lean white meat chicken and low-fat coconut curry broth makes it fit, filling, and healthy soup. This Khao Soi recipe yields 4 generous servings. Like I always say, for diet plan you can portion it (anyway you prefer), depending up-on point-system you using. Soup also freeze well. You can freeze soup without zucchini noodles. Zucchini tastes best when added fresh spiralized to hot coconut curry broth. Hot broth cooks zucchini perfectly al-dente. It tastes amazing with some bite as if chewing on regular egg noodles. LOVE IT! So for carb-free diet plan days are going great. 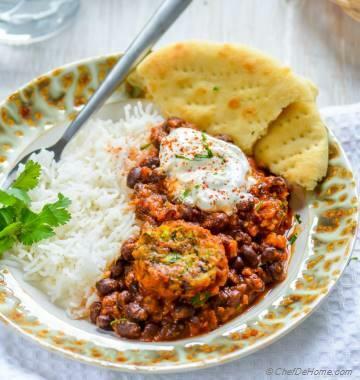 As promised, I'm adding this recipe in South Beach Diet Collection. Don't forget to pin. Are you watching Instagram for behind-the-scene stories of my carb-free days? Don't forget to share with me if you following along. I hope you will enjoy Khao Soi as much as we did. I still have a batch of Khao Soi Paste in refrigerator. This soup will be on menu soon again. Wish you delicious and healthy January of 2018! Smart Swap Replace chicken with shrimp for Shrimp Khao Soi. 1. Heat oil in a large deep sauce pan. Add curry paste and saute for 2-3 minutes until aromatic and darkens in color. Add curry powder, continue saute 30 seconds. 2. Add chicken, coat in curry paste. Cook for 1 minute each side. Follow with generous 2 pinch of salt, coconut milk, chicken stock (or water if using), and jaggery. 3. Bring to boil. Reduce heat, cover and simmer for 18-22 minutes until chicken is fork-tender and soup has thickened a bit. (This soup has lite consistency. If you like more creamy soup. Remove cooked chicken and continue cooking few extra minutes). 4. In meantime, spiralize zucchini with c-blade. Ready the egg noodles. If using egg noodles, you can also cook'em directly in broth in last 2-3 minutes of simmering. 5. Once broth is ready, remove chicken fro broth. Keep broth on low heat. Shred chicken with forks or dice small. To assemble, add shredded chicken in bowl with portion of zucchini. Top with coconut curry broth, basil, red onion, cilantro and lime wedges. Serve hot and enjoy. *Use low-fat, unsweetened coconut milk. this soup has thin consistency. For more this creamy soup, use 1/4-1/2 cup coconut cream. **Grab recipe to make Homemade Yellow Curry Paste. How long soup is good if I keep in fridge? Soup should be good for 3-4 days without noodles. I recommend adding noodles just before serving. Making this tonight. Where it says water in step 2 is that when the broth is added? Assuming so but wanted to make it turn out right. Thanks. Hi Diana, thanks for bringing this to my notice. Yes, Step 2 is when chicken stock/broth is added (in place of water). I updated the step. You can also view the Kha Soi video, just above the Recipe Card. Happy cooking. This was delicious and so easy to make! I will definitely be making it again. I used full fat coconut milk and skipped the sweetener. I did miss the crispy noodles on top- I might try adding bean sprouts next time. Thank you for a great dinner! Joanie, thanks for sweet feedback. I love that you enjoyed Khao Soi. Now, I’m thinking why didn’t I use sprouts for some crunch. Great idea! Thanks for sharing. Thanks Jane, I hope you enjoy. Savita...YUMM! This looks exactly like something I would make! Can we just be neighbors?...you make this, I'll make dessert :) Thanks for sharing! Wow, is this gorgeous or what!? Looks SO amazing- really cannot wait to try it out! Soups are a must right now, and I love this version of the soup. It is so colorful and I am sure it is filled with tons of flavor. Saving it and making it soon. WOW I love the colour of this soup! I can almost taste it just by looking at the photos! This soup looks so amazing! I love that it uses zoodles! I love soup with the coconut base and its very healthy as you used the zucchini instead of noodles.